You are on the race track, ready to bolt toward the finish line. But on the count of three, instead of running to win, you experience a sharp pain beneath your right heel and the arch of your foot that immobilizes you. This is a clear symptom that you have plantar fasciitis, a common foot problem that affects 11%-15% of adults (1). Fitness enthusiasts, runners, dancers, and pregnant ladies are prone to suffer from it. And the BEST way to treat it is by exercising and taking rest. This article lists 10 effective exercises that will help you recover quickly. But first, let’s understand this condition, symptoms, risks, and why you need these exercises. Swipe up! How Is Plantar Fasciitis Caused? Taking up a new physical activity. Endurance sports like a marathon, triathlon, etc. 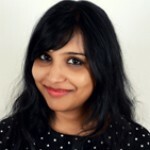 Jobs that demand prolonged walking or standing. Repetitive cardio motions like running, aerobics, etc. Foot arch problems like high arch and flat foot. It is clear that apart from flat foot and high arches, plantar fasciitis is mainly caused due to tight muscles and repeated movements. If you think you have plantar fasciitis, take a look at the symptoms below before jumping to conclusions. Pain in the medial heel region. Pain while getting up and walking after sitting for a long duration or after getting up from the bed. Pain reduces after walking for a few minutes. Now, let’s start with the exercises for plantar fasciitis. Note: Talk to an orthopedician before you start these exercises. Be very gentle with your foot with these exercises and stretches. Do not hold the stretch too long if it starts hurting. Stand facing a wall. Take one step back, and place your palms flat on the wall at shoulder level. Place the affected foot back, flex your other knee, and push your hips up, toward the wall. Your hands should remain straight. Hold for 3 seconds and release. 3 sets of 3 seconds hold. Stand facing a wall and take one step back. Place your palms flat on the wall at shoulder level. Put the affected foot forward, toes against the wall, and your heel on the floor. Flex your knee and push it toward the wall and feel your Achilles tendon and plantar fascia stretch. The other leg should be straight. Hold it for 5 deep breaths. 3 sets of 5 deep breaths. 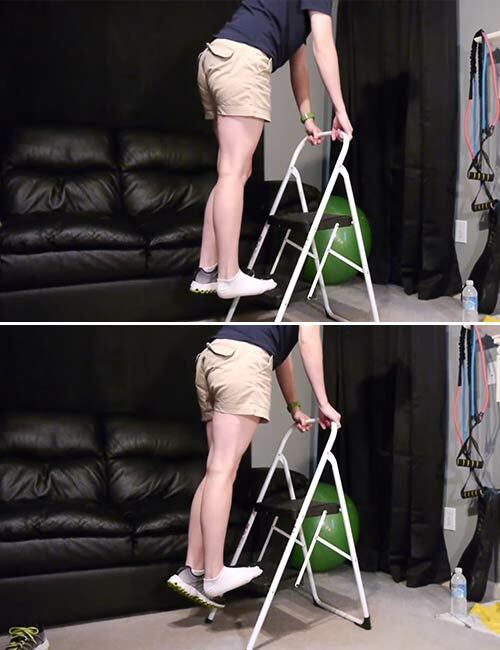 Use a step ladder or the stairs to do this exercise. Place the foot affected with plantar fasciitis on the step. Make sure the ball of the foot is placed on the edge of the step. Drop the heel and feel a stretch in your plantar fascia. Hold it for 20-30 seconds. 3 sets of 20-30 seconds hold. Grab a rolled towel by its ends. Sit on a chair, and place the towel against the arch of the affected foot. Lift your leg off the floor and extend it in front of you while holding each end of the towel with each hand tightly. Hold it for 10-30 seconds. 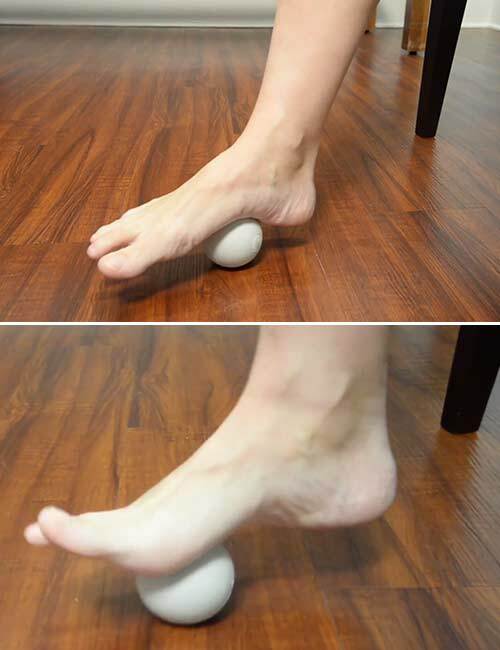 Place the towel against the back of the ball of your foot and stretch again. Hold it for 10-20 seconds. 3 sets of 10-20 seconds hold. Assume the table pose and flex your toes. Walk the hands back and bring them near your knees. Feel the stretch. Make sure you sit on your heels. If you are comfortable enough, place your hands on your thighs and feel the stretch in your toes and the balls of your feet. 3 sets of 10-30 seconds hold. Sit on a chair. You can do this before getting out of bed, and in that case, sit on the edge of your bed. Place the affected foot on a tennis ball. Move your foot up and down and massage the plantar fascia or the sole of your foot with the ball. Do it until you are comfortable placing your feet on the floor and walking. Sit on a chair or sofa. Place a chilled water bottle on the floor. Place the foot with plantar fasciitis on a tennis ball. Do it for 2 minutes. Sit on a chair. Keep your back straight, and feet flat on the floor. Keeping your toes and heels on the floor, try to pull your knee up so that you form a deep arch on the arch of your foot. Hold it for three seconds and release. Sit on a comfortable surface. Place a towel on the floor and keep 10 marbles on it. 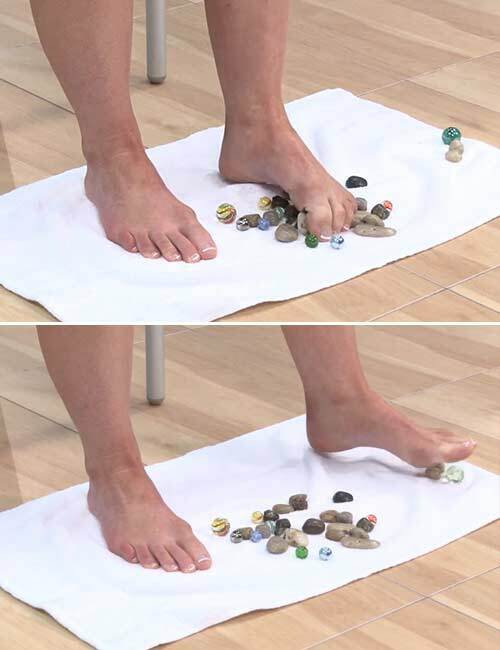 Place your feet on the towel and use the affected foot to grab one marble at a time and place it on the side of the uninjured foot. 2 sets of 10 reps.
Place the foot with plantar fasciitis on the knee of the other leg. 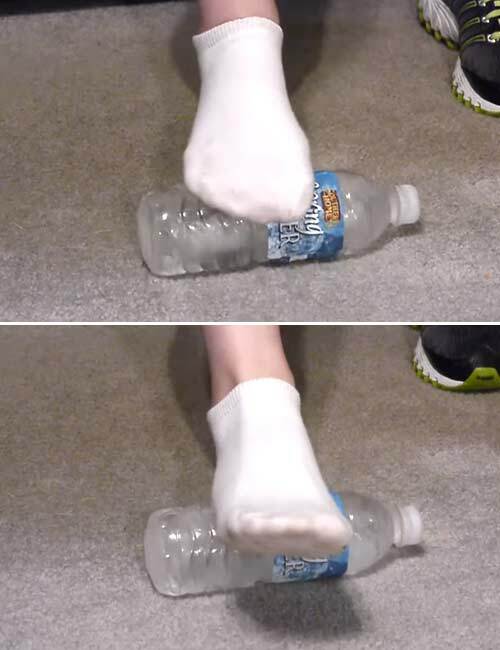 Place the thumbs right in the middle on the sole of your foot. Massage this area slowly. Apply gentle pressure, massaging up, down, and the sides of your sole. Do it for 5-7 minutes. These are the 10 best plantar fasciitis stretches and exercises that will help you recover quickly. There are also other ways you can reduce heel pain. Take a look at the list below. To conclude, ignoring a sharp heel pain or plantar fasciitis will further fuel the problem. So, take proper rest, talk to your doctor, and do these exercises and stretches. You will see a difference in just a few days and return to your normal daily life quicker than you can imagine. Take care and get well soon!